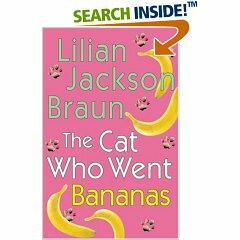 The title of THE CAT WHO WENT BANANAS refers to the Siamese cats, who steal banana peels and leave them lying around so Alden can trip on it as neither cat likes Alden, especially Yum-Yum. One has to feel sorry for Quill who is deserted by his lady love Polly who is too busy opening her new bookstore to pay much attention to his needs. 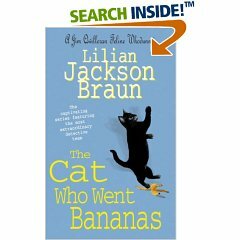 Lillian Jackson Braun has written another delightful story starring two adorable felines and a hero who wants to know if the two people who died were murdered. James Qwilleran and his famous felines, Koko and Yum Yum, are back for another mystery-solving stint in the beloved bestselling Cat Who . . . series. The good people of Pickax are agog with anticipation: Not only is the new bookstore, The Pirate's Chest, about to open, but the Theatre Club is set to perform Oscar Wilde's The Importance of Being Earnest. The play does not continue past opening night, however, for a member of the cast is killed in a car accident . . . or was it an accident? Koko seems to suspect otherwise, and Qwill and his clever cats have their work cut out for them. James Qwilleran and his famous felines, Koko and Yum Yum, are back for another mystery–solving stint in the beloved bestselling Cat Who … series. The good people of Pickax are agog with anticipation: Not only is the new bookstore, The Pirate’s Chest, about to open, but the Theatre Club is set to perform Oscar Wilde’s The Importance of Being Earnest. The play does not continue past opening night, however, for a member of the cast is killed in a car accident … or was it an accident? Koko seems to suspect otherwise, and Qwill and his clever cats have their work cut out for them.